On January 7, General Director of Mabuchi Motor Vietnam Co.,Ltd. - Mr. Hoang Son visited and donated 35 DC motors to seven robot teams of LHU. The program was also attended by Mr. Okamoto - Deputy General Director, Mr. Nguyen Phuc Bao - Head of Design Department (former student of course 1998), LHU representatives including Mr. Nguyen Vu Quynh - Vice Rector, Mr. Le Phuong Truong - Vice Dean of Faculty of Mechatronics - Electronics and Mr. Le Hoang Anh - Deputy Head of Robocon Management Board. 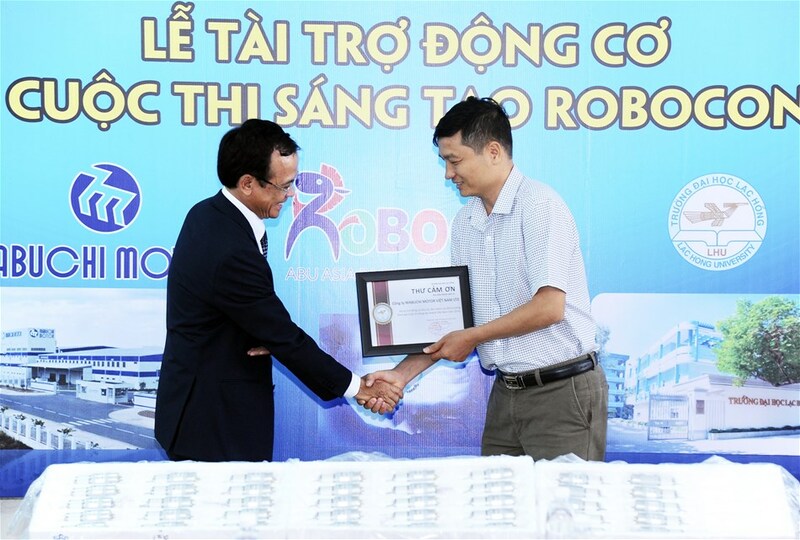 Speaking at the program, Mr. Hoang Son - General Director recognized that LHU had achieved big prizes at the national and international robot competitions. Especially in the context of the industry 4.0 growing strongly in Vietnam, training institutions play very important roles in developing skilled human resources. Therefore, Mabuchi Motor VN Company wishes to expand cooperation relations with the University to create conditions and opportunities for students to study and develop. Further goals are together holding hands to develop high quality and qualified human resources. This is not the first cooperative program between 2 units. This relationship has been established for many years from the scholarship programs of METI organization; from the majority of LHU students who are holding key positions at Mabuchi Motor VN. This time, the Company sponsored motors to serve tech-loving students' research and manufacture. Vice Rector of LHU Nguyen Vu Quynh also shared this sponsor activity was a very valuable gift in the University's training work, being approached with the brand Mabuchi Motor VN which was known for its smart technology, modern products and leading brand in the world. Not only with Mabuchi Motor Vietnam, the University always takes every effort to create steady relations with other enterprises in training, supplying quality human resources, contributing to promoting the goal of development for businesses, the University and students.